Oh my goodness, this was divine. 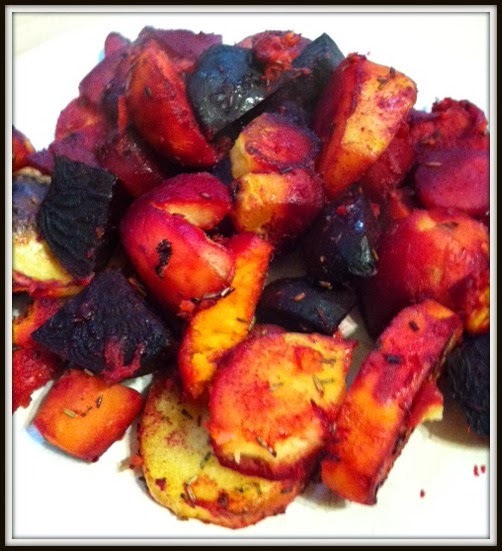 I've been wanting to try it for a while after I saw this recipe for roasted beetroot and sweet potato. It looked so delicious. Finally managed to track down some beetroot from Tesco and, me being me, decided to not follow the recipe but go my own way. So here it is! The beetroot stains the other veggies, which is where I got the name from. It's so tasty, filling and Syn free. All the vegetables were peeled and chopped into bite sized pieces before putting into a large roasting dish. I know beetroot is very red, but was surprised by how much it actually stained my chopping board and hands, so be careful! I don't know why, but didn't think they were THAT red when raw. I had lobster in mind, which changes colour once cooked. But I was wrong, beetroot is very very red. I sprinkled the herbs and garlic over the vegetables, with a good amount of salt and pepper. Added some hot water, enough to just cover the bottom of the pan, before spritzing with fry light and covering tightly with tin foil. I put it in a hot oven for about 50 minutes. You're aiming to almost steam the vegetables. If you chop them smaller, they'll cook quicker and visa versa. Check your veggies are cooked through though with a knife; Your oven may take longer than mine. Take the tin foil off about ten minutes before the end to help them crisp up. The natural sugars in the beetroot, make the dish lovely and gooey, as well as a beautiful pink colour. It's comfort food of the highest order and delicious. I had it by itself, but it would also be beautiful with grilled chicken or your weekly roast, or even some shredded cabbage. Photo A Day - February on the cards?